Bobbysez: Of books & audio visual. Finally the Biomechanics DVD!!!!!!!!!!!!! Of books & audio visual. Finally the Biomechanics DVD!!!!!!!!!!!!! It's here after fits & starts - my running biomechanics & drills DVD. Triathlon, The Run - Comprehensive Running Biomechanics & Drills. 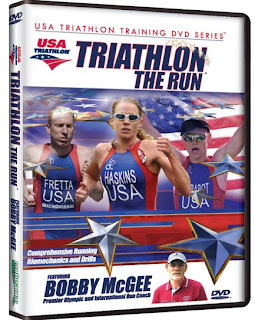 It is available through my website http://www.bobbymcgee.com/ or http://www.endurancefilms.com/. It's strange, all 3 books that I have written were sourced differently in terms of their initiation. Magical Running was written because I'd come to a point as a coach where I realized that the immense efforts thrown at coaching individuals, especially at the highest level, were never going to be rewarded with commensurate results. By "coaching" I mean working the physical details, designing workouts, refining training, blood work, nutrition, equipment, routes, altitude, training theory & application... All this so often amounted to nought on the day of the really big competitions because of what was going on mentally & emotionally for the athlete - here there was no distinction between normal human being & athletic super being; the normal human frailties ruled & the performance most often showed it. So often the physically "inferior" athlete won the day. But they were mentally WAY superior & I knew both through formal training & instinctively that winners can be made mentally as well. It took me years to fully grasp the subtle performance differences between the mental & the emotional. Through extremely empowering personal work that I did & within the context of my formal sport psychology training, I came up with a mental skills training model that formed the basis for Magical Running. It has subsequently been proven to a be rather successful guide for those that take on the often confronting task of self-discovery & the replacement of mindsets that hold them back from the performances their bodies are capable of. Then came Running Sports Essentials, now sold out of its 1st edition. Again a booklet that was not directly about run training - born of a realization: when we begin running, we do not start from zero, but years of plain old living has left us at minus something in most departments. Run training alone will lead us to injury & at least to a plateau. The framework upon which we build the running needed to be Kenyanized; brought to a place where it could properly absorb training in order for performance & not breakdown, to result. Of course when it comes to muscle activation, dynamic warm up activities, stability training & effective post training activities there is so much new research coming to the fore that I decided that Running Sports Essentials needed to grow into Running Sports Essentials Plus. And don't you know it, there is much that needs to happen before what's been percolating in my mind after countless consultations with experts, & final fruition in the form of a publication. So to those of you who are asking for Running Sports Essentials & those of you who have benefited from using it, please be patient, I will get to it! Then came Run Workouts for Runners & Triathletes. This time I was offered an opportunity to do what I have always wanted to do, but was too busy doing it practically, to write it all down in one cohesive piece for others to apply & use. Again there was the fear of rejection & self-doubt in the light of the great books & great successes of great coaches that were already out there; but you know how it goes, nothing ventured nothing gained. At least I knew the principles had produced Olympic Gold, world records, world champions & Olympians, so it couldn't be all bad right? Writing it was a slog, I will not tell a lie, but when the 1st emails started to arrive of PRs & invigorated running, triathlon & walking success stories I felt the effort was justified - not that being published is not one of the neatest feelings out there. Yes, you read correctly, walking. Years ago I coached a multiple world champion & world record holding masters race walker, by name of Barbara Nell. She still races & now also coaches & by using Run Workouts for Runners & Triathletes, she has produced some astounding age group/masters walkers - like a 26:20 5km for a female masters athlete, or a sub 47min 10km for male masters walker. I get so many emails to the website (http://www.bobbymcgee.com/) of athletes successes on a weekly basis - thank you! 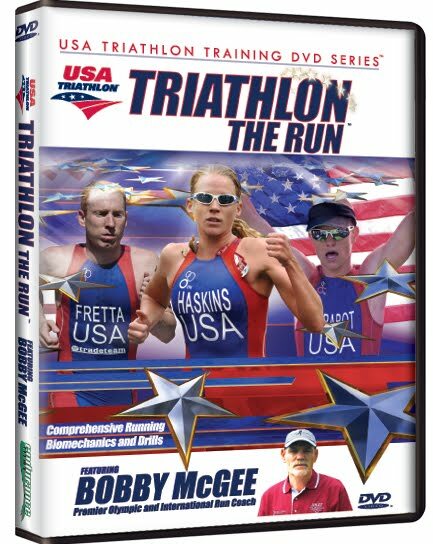 Now finally the running biomechanics DVD, Triathlon, The Run - Comprehensive Running Biomechanics & Drills. The last 8 years or so have brought the need for me to assist the countless great US swimmers that come to the sport of triathlon without a running background. Of course coming from South Africa, with a background in working with African runners who run BEAUTIFULLY because of how they grew up, it is kind of ironic! Now I have come to use my background in formal biomechanics training & the zillion hours of watching running done both well & poorly to assist in teaching individuals to do something that they would have learned naturally if they had lived miles from school on dirt roads, had no shoes & no transport other than their feet. I see athletes almost daily to help with their mechanics. I formally teach running biomechanics at least once per month & always the request was the same - "Can we have a DVD of this, how are we going to remember how to do this, how can I teach this, how am I going to learn this from what I have written down?" To improve your fitness takes weeks at best, but some mechanical interventions can improve your running instantly. Learn how & why you run as you do, assess whether your mechanics are holding you back & do the drills - you will run easier & faster. Well now you have it - my approach. Of course, now, a year on from shooting (last April), I wish I could have added another 30 minutes with the new stuff I have learned. So next time you see me, ask me about launch angles & set up & I'll gladly comply! Although the focus is on triathletes, the running mechanics principles hold true for all endurance running - in fact for the average runner it is easier to relate to triathletes than elite runners as they are slightly larger & have certain running challenges because of the swim & the bike, making them more "normal" than the sub 120lb males & sub 100lb female runners we see blowing around the marathon courses & tracks of the world like nothing more than feathers upon the wind! So visit with me on the website & see if we have something than will help you run just that smidgen faster/better.